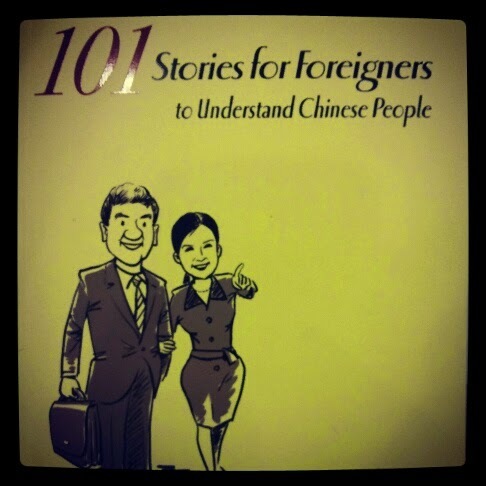 101 Stories for Foreigners to Understand Chinese People is written by Yi S. Ellis, a Shanghai-born woman raised in America. She moved back to China as an adult with her American (presumably white) husband, Bryan. Through the cross-cultural experiences she's had with Bryan interacting with her family and adjusting to life in China, she has compiled a trite list of 101 anecdotes that demonstrate behaviour that Chinese people find weird about Americans/westerners and vice-versa. As one Goodreads reviewer points out, the book's biggest weakness is that Ellis writes at approximately a 3rd grade level. One of my friends' kids is 5 years old and, with little assistance, she could write (or at least dictate) a more sophisticated guide. Paradoxically, it is a remarkably easy read and painful to get through due to errors. This book is not researched in any fashion. If you are looking for insight into the origins of some Chinese behaviours or reflections by the author about their experiences, you have come to the wrong book. About 10% of the content was useful with maybe 1/3 of the stories coming across as interesting. For example, a western friend told me the other day she found it rude and strange that the Chinese CEO of her organization always left events early. That night, I read about high ranking people leaving celebrations early so guests can start partying without feeling judged or leave if they want to without offending their bosses. I'm not sure how accurate this is but it provided a plausible explanation. Conversely, multiple stories about how her husband made mistakes while learning Chinese are neither educational nor interesting. All of her stories should be taken with a gigantic grain of salt. She vastly oversimplifies and generalizes. Any middle-aged or older Chinese couple displaying affection, including holding hands, is engaged in infidelity. Blowing one's nose into a tissue offends Chinese people. The author's perspective is very limited. Even though she has Chinese parents, speaks Chinese, and has lived in China for several years, she gets around by driver and does all of her shopping in supermarkets. She doesn't want to buy off local vendors because she doesn't know the prices and might get ripped off! God forbid she interact with a Chinese person who isn't hired by her husband or raised her. Of the 101 anecdotes, nearly all are about interactions between her husband and business associates, her family, or their nanny. Keeping all of this in mind, I would still recommend this book to people coming to China for the first time. You can read it on the plane, cover to cover. If you already live here, you won't have any major revelations but might get something out of it. Even better, if you have literate children over the age of 9, you can get them to read it and clue you in on the best parts. 101 Stories is out of print but you can find it in libraries or used. A Canadian married to an Irishman living in China. My baby likes my singing. My dog is blind with one eye. I laugh loudly and have big teeth. Young and happy member of the Crimez (Cruz+Grimes) family. I backpacked East Asia with my best friends and a "No Plans Plan" in 2010. I did a "Cross Canada Crimez" road trip with my husband in 2016.